Human Rights Commission of Pakistan Text/Report to support questions. ... It is the will of the people of Pakistan to establish an order ... wherein shall be guaranteed fundamental rights, including equality of status, of opportunity and before law, social, economic and political justice, and freedom of thought, expression, belief, faith, worship and association, subject to law and public morality. No one shall be subject to coercion which would impair his freedom to have a religion or belief of his choice. No one shall be subject to discrimination by any state, institution, group of persons, or person on the grounds of religion or other belief. 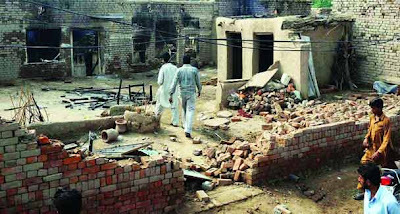 In Karachi, a Hindu factory worker, Jagdeesh Kumar, was killed outside his workplace by a mob, which comprised of many of his colleagues. He was allegedly accused of blasphemy. The law enforcement agencies did nothing to save the young man. (D, Apr 26, May 11) In early May, Dr Robin, of Hafizabad, who had lived and served in that town for thirty years was booked under Section 295- C of the Pakistan Penal Code. The doctor was charged with blasphemy when he joked with a patient about the latter’s unruly beard. After incitement by a local Imam, hundreds of residents marched to Dr. Robin’s residence threatening to kill him and his family. While the mob encircled Dr. Robin’s house, law enforcers stood by and watched the whole episode silently. A Christian welfare organisation rescued the doctor and Jagdeesh Kumar: Done to death by his co-workers. State 7 8 ate of Human Rights in 2008 his family from likely death. Dr. Robin was put in jail and the uprooted Robin family had to go into hiding to escape the anger of religious extremists. 1. The blasphemy law was promulgated in 1985 and in 1990 the punishment under this law, which sought topenalise irreverence towards the Holy Quran and insulting the Holy Prophet (PBUH), was life imprisonment. In1992, the government introduced death penalty for a person guilty of blasphemy. Immediate abolition of ‘blasphemy’laws is needed as these provisions are often used against non-Muslims as well as Muslims to settle personal scores. 2. School curriculum has to be sensitised toward non-Muslim Pakistanis so that children feel safe, secure and equal. 3. The Ahmadis have been denied the benefit of the joint electorate system which was revived in 2002. The discrimination should be ended. 4. The Commission on Minorities should be made functional by reinforcing its independent status and providing it with the necessary resources, human as well as financial.Christians demand end to occupation of a church by the land mafia.